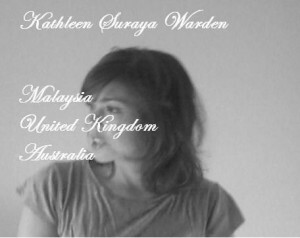 Suraya Warden is an International Art Consultant, Independent Curator and Arts Writer based in Kuala Lumpur, Malaysia. As an Independent Curator and Writer in S.E Asia, Suraya is readily available to service private art galleries with exhibitions, curatorial text, layout and display, and publicity design on a project basis, and to write items such as feature articles, biographies and exhibition reviews. As a Consultant Suraya enjoys working in close partnership with art lovers to find and purchase works of art on their behalf and help build balanced private art collections. She also offers collection management and display services for existing collections, academic and art market research, market guidance and public speaking. Suraya works solely for and on behalf of the client taking no interest from stakeholders such as galleries, dealers, artists and auction houses. However, with her network of contacts in these fields and her strong visual arts foundations, Suraya can source beautiful art for any home, budget, client or purpose. Suraya Warden is a British and Australian citizen with mixed British and Malay heritage. She is a graduate of the Australian National University with Bachelor of Arts First Class Honours in Art History & Curatorship, and a second Bachelor of Asian Studies (China Spec.) under which she studied Mandarin. Suraya lived in Beijing, P.R China for two years as an undergraduate, before writing her thesis on late 19th century Russian art to complete her Honours degree in Australia. In 2007, Suraya spent a year as part of the Curatorial department in International Painting & Sculpture at the National Gallery of Australia working with an incredible permanent collection of 19th and 20th century works and assisting on the blockbuster exhibition Turner to Monet. She then moved to London in 2008 to undertake internships at Sotheby's Bond Street, where she wrote about the Damien Hirst sale Beautiful Inside My Head Forever, and Art Council England's Contemporary Art Society Consultancy Division, where clients include Heathrow Airport Terminal 5 and The Economist. Suraya relocated to Kuala Lumpur in 2009 in order to pursue interests in the private art market and collector consulting and to make herself available to individual clients. Please visit www.surayawarden.info for more information.